Food marketing to kids is flat-out unethical and should stop. As someone who’s made it a goal to help bring an end to junk food marketing to kids, I feel an ethical dilemma about supporting these recommendations without tacitly endorsing kids being barraged with even more marketing in their lives. Is saying we only have to fight the food marketing that hurts kids like saying we only have to fight the sexism that hurts women or the racism that hurts minorities? 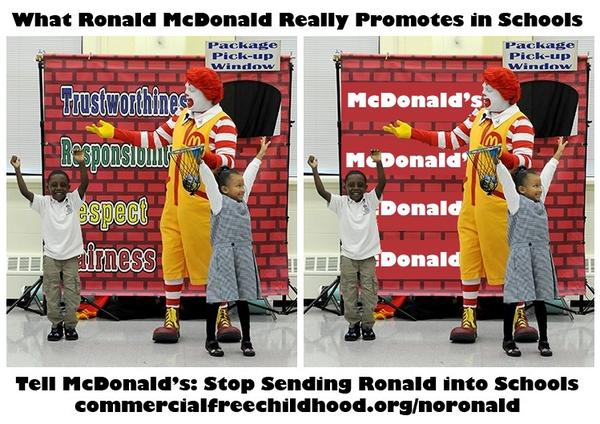 I want companies like McDonald’s to give kids freedom from food marketing and tossing a clementine into a Happy Meal doesn’t make it okay for them to tell kids fast food is lovin’. 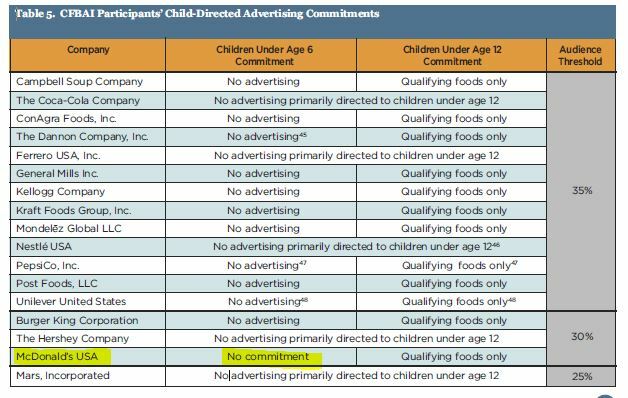 I appreciate that the HER recommendations were in response to a growing recognition that the Children’s Food and Beverage Advertising Initiative (CFBAI), the food industry’s self regulation program, leaves gaping holes which are exploited at the expense of children’s health. In addition, existing definitions of child-directed marketing contain loopholes, which exclude child- and youth-targeted product packaging, in-store promotions, and toy premiums. If a corporation truly wants to help education, donate through existing non-profits, not through marketing schemes. A good education is actually anathema to corporations like McDonalds, as it teaches students the analytical skills to dissect ads for half truths and hyperbole (and to know what hyperbole is). Using schools to market fast food to children is especially disturbing in light of new research linking fast food consumption to lower test score gains. Healthy schools help families avoid fast food instead of making people feel obligated to go to McDonalds for McTeachers Night. 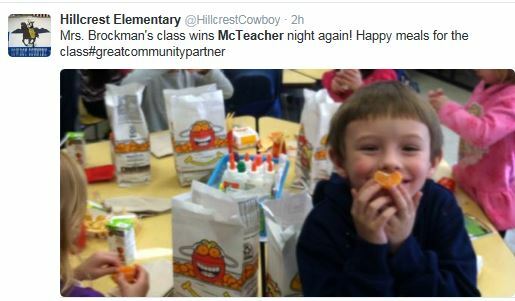 Healthy schools also don’t reward children with Happy Meals for having the highest attendance at a fast food fundraiser. So how do ethical people and organizations bring about changing the unethical practices of food marketing to children? Instead of small steps which can tacitly endorse adding even more marketing to children’s lives, I suggest going after the company using the most aggressive tactics with the highest number of ads. Focusing our efforts on McDonald’s would send an important message to all companies that there is a coming backlash against food marketing to kids. This is how Joe Camel was ousted from childhood and this will also bring about the inevitable ousting of Ronald McDonald and other food marketing from their lives. Tags: fast food, Food as Reward, Marketing to children, mcdonald's. Bookmark the permalink. Casey — I recently discovered your blog and applaud your work in calling out Big Food’s harmful food marketing practices. My question is this: Have you ever considered how food is eaten and portrayed in movies as another form of marketing? I’m not just referring to product placements, which we’re all familiar with. I’m also referring to the portrayal of the characters’ relationship to food. For example, I recently saw a trailer for the new Disney movie Inside Out. It included scenes of a family eating dinner at a table in their home, but the dinner was Chinese takeout and supersized cups with lids and straws (suggesting soda). Here’s a link to the trailer: https://www.youtube.com/watch?v=x9KZdW7ko20. The scenes are at the 1.06, 1.11, and 1.25 marks. (Compare this scene to one in the Incredibles (https://www.youtube.com/watch?v=c023qFRSBqc), which shows home-cooked foods on the dinner table.) While I realize that most people eat takeout from time to time (and I’m not condemning that), putting it in a movie targeted to kids makes it appear that this is what everyone does all of the time. Very distressing. Good point and I hadn’t noticed that before. It’s definitely something I’ll look at and highlights just how pervasive these messages to kids are.